California embodies the American desire to explore frontiers. 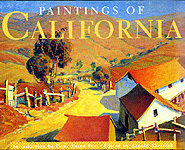 Collected here in Paintings of California are the works of more than sixty of America's finest artists, all of whom were drawn to the beauty of California's kaleidoscopic geography and the diversity of her people. The more than ninety landscapes, seascapes, and cityscapes in the book are a revealing depiction not just of the changing topography but of the creation and persistence of the myth of the American dream. The images demonstrate the inspiration provided by sun, sky, and sea, and range from awe-inspiring renderings of giant sequoias to prophetic warnings about the costs of urbanization. Among the painters included are Albert Bierstadt, George Bellows, Richard Diebenkorn, Childe Hassam, David Hockney, George Inness, David Park, Frank Romero, Ed Ruscha, Alexis Smith, Wayne Thiebaud, and Nicola Wood. Accompanying the paintings are brief selected writings from such authors as John Muir, Mark Twain, Henry Miller, Jack Kerouac, and John Steinbeck that echo the passion of the paintings. In her introduction, Ilene Susan Fort amplifies these excerpts, exploring the history of California and its art and also the unique qualities that have made the state so seductive to explorers, tourists, and artists alike. The book concludes with biographical notes on the artists and information about the collections of the major California museums. Ilene Susan Fort is Curator of American Art at the Los Angeles County Museum of Art. She is the author of The Figure in American Sculpture (1995), two books on Childe Hassam, and several exhibition catalogues. Among her numerous articles and essays is a contribution to Independent Spirits: Women Painters of the West (California, 1995). Arnold Skolnick has produced many books on American painters, including volumes on Ben Shahn, Paul Cadmus, and George Tooker, and is the editor of Paintings of Maine (1991) and Paintings of the Southwest (1994).